# 39 in our Waikiki map. Hotel Name: .... Royal Kuhio condo. Address: ......... 2240 Kuhio Ave. 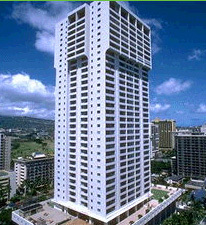 Built in 1976, this tall building sits in the center of the city block of Kuhio Ave between Royal Hawaiian and Seaside Avenues. 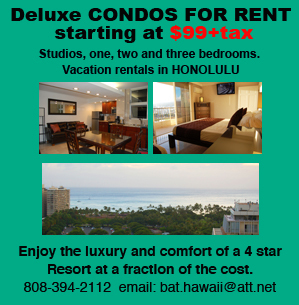 It is NOT a hotel but a considerable number of units are rented out as vacation rentals. All units are suites with full kitchens. This condo is number "39" within the red zone of our waikiki map, click here to see it's location in relation to other hotels in Waikiki. Spacious common areas including a good size lobby and a swimming pool with and inviting sun-deck. It is hard to predict how well maintained each unit in a private condo is. The main problem with condos is that the condition of the unit that you may end up renting as a vacation rental depends on how good it has been taken care of by it's owner. As a rule of thumb, vacation rental units are never as good or well maintained as hotel rooms are, so yes, you can save some money by staying in a vacation rental but do not think for a moment that the only difference with a hotel of the same category is that you will not have daily maid service. If you have never stayed in a vacation rental before, think of their vacation time quality as better than camping but not nearly as good as staying in a Hotel.